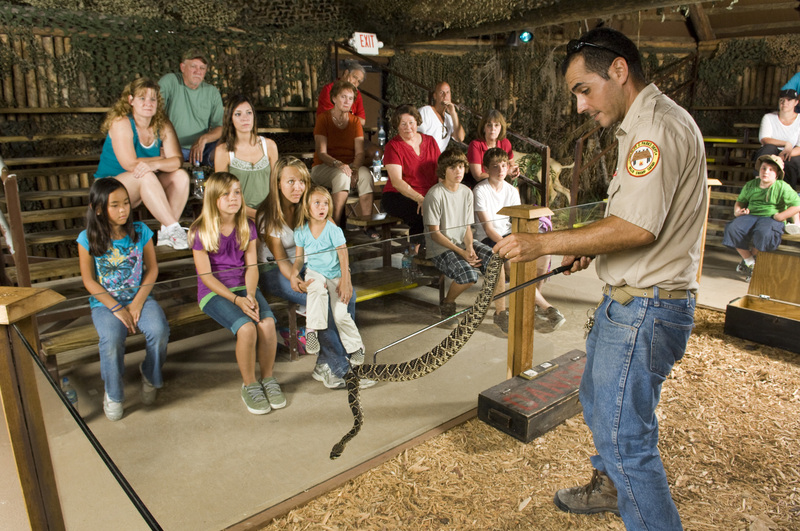 Families looking to cool-down from airboat or swamp buggy adventure can turn to our Everglades snake show. Located in the Billy Swamp Safari theater, visitors can enjoy the air-conditioned space with an up-close presentation of the region’s slippery creatures. Specifically, our Everglades snake handlers will show-off both venomous and non-venomous species. From the graceful Florida water snake to the brown snake, it's a serpent extravaganza! But, don’t worry, you’ll be safe behind a protective glass while you enjoy these natural inhabitants of the Everglades. On the other hand, our expert handlers will tell you everything you need to know about these amazing reptiles and why they are vital to the Florida Everglades. As a result, your kids will be at the head of the class in their next natural science class back home. There are over 20 different species of snakes in the Florida Everglades, but only four of them are venomous. As such, snakes are an integral part of the Everglades ecosystem. For example, they help to maintain stability and balance in the wilderness. Many snakes feed on insects and bugs that harm the region, while others eat other venomous snakes. By helping to regulate the rodent population and providing food for alligators and birds, snakes are a welcome part of the wildlife. Florida Everglades vacation families can get up close and personal with these creatures in a safe way. Namely, our Everglades airboat ride makes it easy to get a snake encounter without worry. In other words, our airboat guides will show you places they hide and are often overlooked. At the same time, we’ll make sure you get some great pictures of your best Florida family vacation yet. Although many different snakes slither through the Everglades wetlands, most of them are harmless and useful to the environment.